Want a perfect holiday feast? 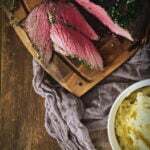 This Herb Rubbed Top Round Roast Beef is the cheap cut with tons of flavor that will leave your guests totally impressed! Mix the parsley, thyme, and shallot in a small bowl. Remove 2 tbs of the herb mix to another bowl and set aside. Add the mustard add 1 tbs of the oil to the remaining herb mix and stir to combine. With the previously reserved herbs, mash in the butter with a fork to mix everything well. Butterfly the roast by carefully cutting down the center of the roast, folding the cut end of the beef back, flattening, until you have cut almost entirely through. This allows for a better seasoning application throughout the beef. While spread flat, season liberally with salt and pepper on all sides. Using your fingers, spread the mustard mixture evenly over the interior of the meat. Fold the meat back up and tie with kitchen twine. Cover and allow the beef to rest in the fridge at least 4 hours. When ready to cook, preheat the oven to 275 degrees F.
In a large oven-safe skillet, heat the remaining oil. Sear the beef on all sides, until just browned, about 5 minutes per side. Transfer to oven and allow to cook 1 1/2 to 2 hours, or until the meat temps at 125 degrees F.
Carefully transfer the beef to a cutting board to rest. Spread a generous dollop of the herb butter over the roast and cover with foil. Allow to rest for 20 minutes before slicing and serving.